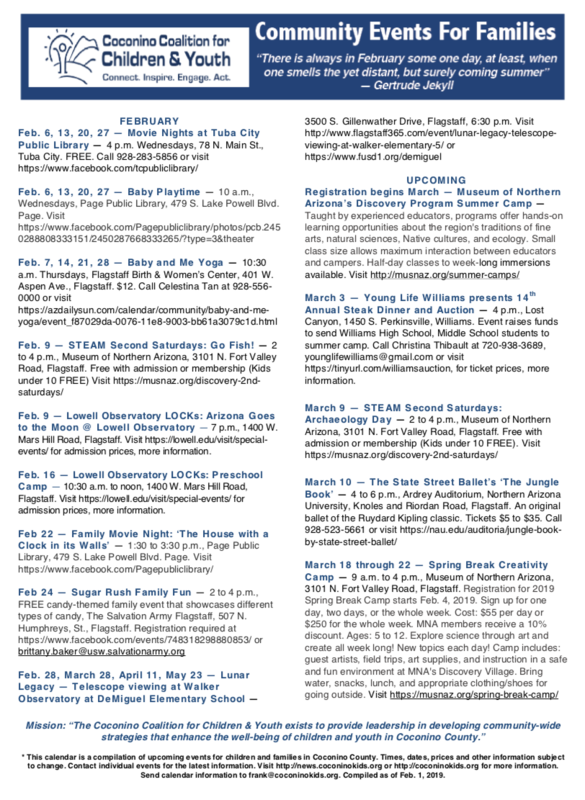 A number of family-friendly events are scheduled throughout Coconino County in February and in coming months. Feb. 9 — Lowell Observatory LOCKs: Arizona Goes to the Moon @ Lowell Observatory — 7 p.m., 1400 W. Mars Hill Road, Flagstaff. Visit https://lowell.edu/visit/special-events/ for admission prices, more information. Feb. 16 — Lowell Observatory LOCKs: Preschool Camp — 10:30 a.m. to noon, 1400 W. Mars Hill Road, Flagstaff. Visit https://lowell.edu/visit/special-events/ for admission prices, more information. March 3 — Young Life Williams presents 14thAnnual Steak Dinner and Auction — 4 p.m., Lost Canyon, 1450 S. Perkinsville, Williams. Event raises funds to send Williams High School, Middle School students to summer camp. Call Christina Thibault at 720-938-3689, younglifewilliams@gmail.com or visit https://tinyurl.com/williamsauction, for ticket prices, more information.